In May, I was honored to deliver an ERE Media webinar sponsored by Jobvite on best practices in social media and employment branding with Prudential Financial’s Brett Underhill. Listen to the recorded webinar with our PowerPoint slides for free here: http://ow.ly/ovKFD. Thank you to ERE, Jobvite, and Brett Underhill for making this employer brand and social media webinar a success. Did I mention prizes, giveaways, and contests? For those in town for the race on Friday night, you are invited to a Jessica Northey tweetup! She is the founder of the largest Twitter chat, Country Music Chat aka #CMchat. Jessica and I will be at the High Velocity Sports Bar in downtown Indianapolis around 6pm. All are welcome. If you are at the track or at home, hope that you will be a part of the fun this weekend that IMS has put together for the fans. Join us on Twitter using the hashtags: #SuperWeekend and #SMGarage. See all of the details regarding the IMS social media garage here: http://www.indianapolismotorspeedway.com/brickyard400/eventinfo/51674/?hide_sidebar=true. Social media brings fans together. It makes events more rewarding for those who are in attendance or watching at home. Since I am not at Daytona International Speedway, this weekend I’m watching the Coke Zero 400 at a NASCAR Hall of Fame viewing party in Charlotte, NC. My friends at Coca-Cola Racing are inviting all NASCAR fans to join in the fun by throwing our own viewing parties to see how real NASCAR fans watch a race. Before and during the race tomorrow, tweet @CocaColaRacing live videos and photos of your #NASCAR viewing party using the #MYCOKERACE hashtag. Coca-Cola Racing is giving away a special race day prize pack to one of my followers which may include: a Coca-Cola branded Grandstands Cooler, a Coca-Cola branded Recycling Koozie to keep your drink chilled, and a Coca-Cola Racing cap! 1. Follow @CocaColaRacing on Twitter: http://twitter.com/cocacolaracing. 2. Tweet a photo of you watching the #CokeZero400 #NASCAR race with the hashtag #MYCOKERACE. Make it a race day to remember! Watching the Daytona 500 at the NASCAR Hall of Fame had a lot of benefits. For less than the cost of parking at a race, you get a comfy seat, air conditioning, food/drinks at decent prices, a 60 foot screen, no commercials, one free iRacing simulator ride, and a scanner. Plus, you are surrounded by other NASCAR fans too. The Coke Zero 400 proved to be an exciting race too. You can always follow Coca-Cola Racing on Twitter at https://twitter.com/cocacolaracing. One disclaimer: the prize was provided and may be shipped to the winner by Coca-Cola, but Coca-Cola is not a sponsor, administrator, or involved in any other way with this giveaway. All opinions expressed in the post are my own and not those of The Coca-Cola Company. While attending SourceCon in NYC, I had the opportunity to tour Foursquare's HQ. Co-Founders, Dennis Crowley and Naveen Selvadurai were there to greet me too. As an active user, I was simply thrilled just to check-in to this location. The genuine passion of each employee is evident when the elevator opens to their offices. Although people are productive and focused on their work, you sense that they are motivated by a greater purpose. I talked with two outstanding employees, Carol and Eric. It was refreshing to hear about their responsibilities and sincere dedication to Foursquare's users. Their offices include private meeting spaces with badges on each door, a kitchen, disco ball and lounge areas for their staff to work comfortably. Innovation, kindness and creativity are valued and on display. It is no surprise that Foursquare is hiring and growing. I'm hopeful that the collaborative core and culture will remain the same. Visiting Foursquare only reinforced my belief in this organization and its continued success. Just How Big Is Social Media in England? At the first Social Recruiting Summit at Google, I met Matt Alder. He is from the UK and an innovator in digital recruitment marketing. You can find out more about Matt at http://recruitingfuture.com. We’ve had an opportunity to meet at other conferences. Since Matt and I work in the same industry, yet in different countries, I’m amazed at how our challenges in social media are similar. Social Media - The New Multi-Level Marketing Pyramid? When you become active in social media, it may feel like you are part of a multi-level marketing (MLM) scheme. There are many other users with more online influence than you. You may believe it is because they were an early adopter of a specific social media network and you joined too late. It may seem that others with little or no experience are able to reach their objectives using social media tools. To avoid the MLM blues, focus on the reasons why you are engaging in social media. Seek out others that could use your expertise and for opportunities to pay-it-forward. The best time to remember your goals is when you log into a specific platform. Don't waste precious time worrying about others. I’m pleasantly surprised at how many social media leaders are genuinely willing to share their experiences and best practices. If you only participate in social media or any other business with a “What’s in it for me?” attitude, you become your own worst enemy and will eventually fail. Use the tools that best suit your professional aspirations and look for moments to help others along the way. The 3rd Social Recruiting Summit kicked off last night with another fun tweetup at Crave at the Mall of America. Thank you to LinkUp for sponsoring this upbeat and well-attended networking event. Below are is the slide deck from my Social Recruiting Summit presentation at Best Buy on Social Integration. I'm grateful for the support from ERE.net, Shannon Seery Gude, VP of Digital & Social Strategy at Bernard HODES Group and Heather Polivka, Director of Employment Marketing with UnitedHealth Group. I was overwhlemed by the support of my friends and family, including my Dad who was in the audience. Thank you to Jeremy Langhans and Ronnie Bratcher for capturing a UStream video of the presenation too. You can find it here: http://bit.ly/9iKfoe. More ideas and photos will be posted soon! Last week, I was invited to speak at the International SalonSpa Business Network (ISBN) Annual Conference at the Terranea Resort in Rancho Palos Verdes, CA. Many senior management leaders and owners from the salon and spa industry were in attendance. The attendees were upbeat, engaging and supportive of each other. It was an honor to be a keynote speaker and provide insights into the ways social media could enhance their brands and marketing efforts. Thank you to ISBN, the sponsors of the conference, and Meeting Expectations, especially Jean Yahres for this opportunity and experience. Are You a Social Media One Hit Wonder? In the world of social media, there are several rock stars that continue to inspire me. Those social media legends continue to resonate above the constant stream of social media noise. This is a list of the different types of social media musicians that we encounter online. Keep in mind that each type is a generalization. Reflect on your social media career to determine which category you may fit in. One of your blog posts was featured on Digg. The spike in traffic to your website was mind-numbing. During that week, you had a 300% increase in subscriptions to your blog. Many conferences and events booked you as a featured speaker. However, a few months later, you found it hard to come up with new ideas and your blog has gone stale. Your start-up idea didn’t get the funding it needed and now you have become a recluse. You’ll be featured this year at SXSW on a "Where Are They Now?" panel. You had what it took to produce a hit and there’s still time for a comeback. The best form of flattery is imitation. By only retweeting consistently what other thought leaders say, you rarely come up with your own opinions. You lurk within the social networks, play it safe and haven’t developed a platform of your own yet. Instead of realizing your own goals, you may be unknowingly supporting someone else’s dreams. Push yourself out of your comfort zone, find your voice and express your own signature style. You have fresh and creative thoughts. Unfortunately, you can’t seem to attract the right fans to your message collectively at the right time. You are a starving social media musician on a corner near the entrance to a subway station. The video you uploaded to YouTube didn’t go viral as planned. You have a handful of followers who are often removed by Twitter for suspicious activity. Find your true niche and determine what you are willing to sacrifice to find success. You dream of winning a Social Media American Idol contest. It may be time to get a manager (aka a mentor) to help you start moving in the right direction. You work on a team and appeal to a specific audience who adores you. Even though this path may have a shelf life, you and your colleagues are currently reaping all of the rewards. There is strength in numbers. Your organization's reputation is larger than your individual brand. You enjoy the VIP treatment, even though most people don’t know your full name. Make sure that you have an exit strategy to reinvent yourself as a solo artist, just in case. You have thousands of followers who enjoy all of your tweets and comment frequently at your blog. For the past few years, you have worked hard consistently and persistently to build your unique brand. You have written a few books and are currently on a world tour. Fans and groupies attend events that you speak at to learn from you. You give back to your community and help others reach their goals in your industry. You have many projects that you are passionate about in the works. Continue to ask questions, stay innovative and engage in several one-on-one conversations. Congrats and keep up the good work! All social media musicians must take the time to reflect. Revise your professional goals, learn from your failures and determine the social media legacy you wish to leave behind. Although the past affects all of us, you can create new opportunities and success for yourself. This week I'm honored to give a social media webinar for members of the American Society for Healthcare Human Resources Administration (ASHHRA) of the American Hospital Association (AHA). The webinar is sponsored by Human Resources IQ. There have been huge strides in the health care industry with respect to social media. Hospitals and medical facilities have looked beyond the strict, historical constraints of the healthcare industry and are leveraging social media more and more every day. View more presentations from Jenny DeVaughn. Examine your social media footprint. You can start by visiting Pipl.com to see what information exists about you online. If you don’t like the content that is shown, you have an opportunity to immediately change it. Start commenting on blogs of influencers in your industry. Contribute a post to ERE or Recruiting Blogs. Be a part of Twitter conversations to share best practices. Create a Google profile. Your social media presence should reflect your passions. Reassess your professional goals. It may be time to hire a career coach to help you identify strengths or skills that you are overlooking. Read, Crush It, by Gary Vaynerchuk for inspiration. Update your avatar. I had the same profile picture for over 6 years, until a close friend suggested that I change it. It is important that your photo shows who you are professionally. Review your online bios. Due to size restrictions, you will have different versions on Twitter, LinkedIn and your company website. Your bio should reflect what makes you special and different from other recruiters, including critical keywords so that your profile can be found. Is your bio a long-winded press release that no one will take the time to read? Plan your social media activities after you set specific goals. Social media networks are designed to engage. You may start in LinkedIn searching for an IT candidate and 30 minutes later you wind up in an alumni group looking for old friends. In order to combat this, calendar specific functions. For example, from 2:00 PM – 2:30 PM, reserve time to find 10 qualified candidates for your Java Developer opening. Change the frequency of your social recruiting activities. Social media never sleeps. How often do you update your Twitter or LinkedIn status? When was the last time you posted something to your company’s Facebook Fan page? Set Outlook reminders to ensure that your communication is consistent to your social media communities. Keep paying it forward to candidates. Conduct a complimentary webinar for your ideal candidates on a subject that they truly value. Volunteer to speak or review resumes at job seekers groups, like a career ministry to help those who need recruiting resources now more than ever. Outline your job notification process. When you get a new opening within your company, how do you promote it to your networks? Is there a standard process based on past recruiting metrics or a random series of posts depending upon how you are feeling that day? Evaluate your accomplishments on specific platforms. Hopefully, you have been measuring your recruiting activities. Review your past placements. Where did your best referrals and candidates come from? When you are determining which social platforms to focus your resources into this year, don’t believe the hype and the propaganda of biased resources. Your best social recruiting platform may be an internal network from employee referrals or cold calling niche online directories of candidates. Remember that your social recruiting strategy is unique. Add innovative tools to your social recruiting tool kit. It may be time to reevaluate your career website and the candidate’s experience with your online presence. Maybe you should consider incorporating video, jobcasts, Facebook advertising or an iPhone app for potential candidates. Be sure that any tactical choices support your comprehensive recruiting plan. In the ever-changing world of social recruiting, there is always room for improvement. Continue to engage with potential talent in new ways and measure your results of each social recruiting campaign. Let’s continue to evolve our social recruiting efforts in 2010! That title pretty much describes my feeling about this conversation with Jenny DeVaughn of Social Precision in Atlanta. I met Jenny at Barcamp Nashville last month and realized she has expertise in LinkedIn…something I have been less than enthusiastic about in the past. In this video, Jenny provides excellent insight into how to think about LinkedIn. The biggest takeaway for me is that LinkedIn is NOT a communication tool like Facebook or Twitter. It’s a research tool. If you make that distinction, it changes everything. Jenny shares some of the ways (some of which are almost scary) you can tap into LinkedIn for business research, business development, networking, and competitive intelligence. If you’re trying to figure out where (or if) LinkedIn fits into your social media strategy, I think the 12 minutes in this video will be helpful. I know it’s got me rethinking LinkedIn. What You May Have Missed In LinkedIn from Bill Seaver on Vimeo. Social media is a tactical part of a larger comprehensive marketing and communications strategy. When starting out in social media, it is important to set S.M.A.R.T.E.R. goals. S.M.A.R.T.E.R. stands for Specific, Measurable, Attainable, Results-Oriented, Timed, Evaluate and Reassess. When I joined LinkedIn in 2005, I didn’t just dive right in without a plan and start wasting time by randomly building my network. I set S.M.A.R.T.E.R. objectives. One of my daily goals was to connect with at least 10 ideal candidates or clients in 5 specific industries within the Atlanta area. As my focus at work changed, I realigned my LinkedIn activities. Now I’m in the top five of most connected on LinkedIn in the metro Atlanta area with over 17,000 first-level connections. I’m able to reach millions of decision makers worldwide. If you do not become S.M.A.R.T.E.R. about your social media activity, it will lead to considerable resources losses, including your time. Most of the professionals that I work with do not have this luxury. Start setting S.M.A.R.T.E.R. goals so that you will have better results in any social media network. Avoid emotional posts that may have even bigger consequences. If you are angry, it is not the time to vent online even if you have been wronged. Today you may complain about your cell phone service via Twitter. In a few months, you may wish to work for that company. One of their employees can search Twitter to find out what you really think of their service. Most of your online activity (blog comments, tweets, etc) last forever. It is not the forum to vent temporary criticisms. Keep in mind that we all kill the messenger. The bearer of bad news online is often associated to the negative emotion we felt when we first found out the unfortunate news. If the depressing news is public information, you must think about the overall harm of associating your brand with this data. Anyone can complain. True leaders create solutions. When online, show that you are working on making your industry or profession better by sharing inspirational ideas and best practices. Pointing out all of the problems won’t win you any supporters or increase your professional brand. Start a thought-provoking conversation and influence change. 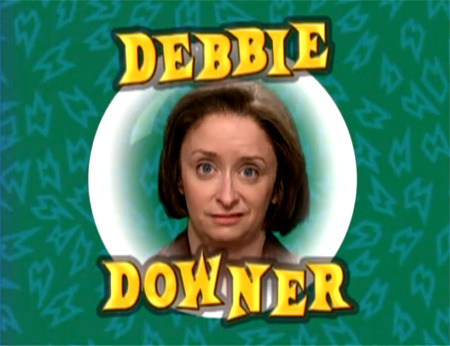 If you have a friend that is unknowingly a social media “Debbie Downer”, provide honest advice without being rude. Take time to have a face-to-face conversation over some coffee to find out more about where the root of their negativity sprouted. Often one's pessimistic social media behavior online is a symptom of a bigger issue. You may find an opportunity to pay-it-forward. Content Doesn’t Win. Optimized Content Wins. People Don’t Expect Your Company to be Perfect. They Expect You to Provide Solutions. Your Customers Are Listening in Social Media. And So Are Search Engines. Many crummy trials beats the big thinking. The Art of Twitter is in the Retweet. You Must be Interesting. Tactics Without a Strategy is Worse Than Doing Nothing at All. Measurement is Like Laundry. It Piles Up the Longer You Wait to Do It. Thank you to Jason Baer for posting these quotes from Li Evans, Debra Ellis, Dr. BJ Fogg, Peter Shankman and Amber Naslund on his social media marketing blog, Convince & Convert.